FLORIDA -- A pig the Florida Keys Society for the Prevention of Cruelty to Animals rescued in March after its owner was charged with fatally abusing another pig on Duval Street has found a new home. Sunshine, as its rescuers named it, is now living comfortably at the Monroe County Sheriff's Office Animal Farm, said SPCA employee Chuck Best. "He's fully recovered and doing well," Best said Thursday. "We knew it couldn't be released to the wild. All his injuries are healed and he's eating well." 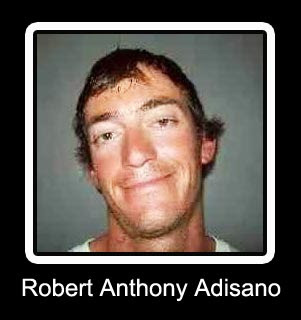 Sunshine was seized from the Key West residence of Robert Anthony Adisano, 25, on March 12, the day after he was charged with killing another pig by dragging it down Duval Street, reports say. Adisano on Monday was ordered to pay $500 in fines stemming from Monroe County animal abuse ordinances that Best filed when he rescued Sunshine, he said. Adisano still faces a felony third-degree animal cruelty charge from the Duval Street incident and his trial date tentatively is set for Sept. 14, Assistant State Attorney Mark Wilson said. In that incident, a police officer reportedly saw Adisano dragging a pig on a leash in the 300 block of Duval Street; Harriet was on her back, being raked down the street over broken glass, reports say. Her nose and mouth were bleeding when she died of internal injuries a short time later while in the care of the SPCA, Best said. Adisano told police he had come from a bar, where he was using Harriet to meet women, reports say. The day after Harriet died, Best removed Sunshine from Adisano's residence and began nursing the pig back to health. Sunshine was being kept in a small cage in "deplorable" conditions and was suffering from lacerations and open wounds when rescued, Best said. "Sunshine is very social," Best said. "He loves back rubs, loves taking baths and loves playing in the pool." NEBRASKA -- Acea Schomaker, the Nebraska man who was cited in March for placing a cat in a makeshift marijuana bong, pleaded guilty Monday to animal cruelty charges in the incident. Schomaker, who recently turned 21, also pleaded guilty to charges of marijuana possession and being in possession of alcohol while he was still a minor, the Lincoln Journal Star reported. Schomaker originally pleaded not guilty to animal cruelty charges in April and has said his intention was not to harm the cat, a six-month-old female named Shadow, but [supposedly] to calm her. Shadow, he said, had behavioral problems that included biting and scratching people. After hearing stories of animals being calmed when humans blew marijuana smoke in their faces, he decided to do them one better and stuffed her inside the smoking device. Authorities came to Schomaker’s residence after responding to a domestic disturbance call (none of the stories detail who made the call or why). 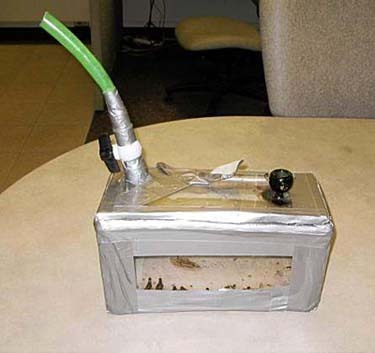 However, when sheriff’s deputies arrived, they caught Schomaker smoking weed from the “boxlike contraption that had the cat stuffed inside its 12-inch by 6-inch base" (about the size of a shoebox). Schomaker was ticketed on suspicion of misdemeanor animal cruelty, and his girlfriend, Marissa Vieux, 23, was also ticketed for animal cruelty because she didn’t try to stop Schomaker. Schomaker was so pleased with himself he told police he had done this THREE TIMES already to the poor kitten. One of the sheriff's deputies involved in the case said Shadow was shaking when she was removed from the device and that part of her body appeared to be covered in urine and feces. "This cat was just dazed," Sgt. Andy Stebbing said. "She was on the front seat of the cop car, wrapped in a blanket, and never moved all the way to the humane society." The cat was taken to a Lincoln, Neb., animal shelter, where she was reportedly in good condition after the effects of the marijuana wore off. Schomaker will return to court Sept. 18 for sentencing; he could face up to a year in jail, according to the Journal Star. 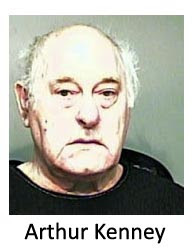 MICHIGAN -- Kenneth Lang Jr. was on social security, obsessed with Chihuahuas and flat broke. 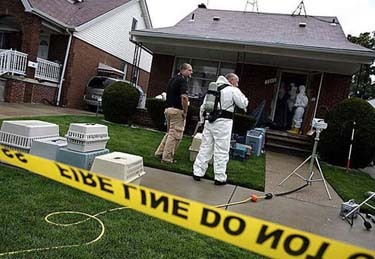 That combination led to the scene last week in Dearborn where authorities removed more than 100 living Chihuahuas from Lang's Orchard Avenue home, as well as more than 150 frozen dead dogs wrapped in plastic. The Detroit News reports that Lang filed for bankruptcy in 2006, listing $73,663 in debts and requesting he be allowed to hold on to "three dogs" valued at $25. Lang also disclosed a $25 a month expense for pet care, which he listed as "regular expenses from the operation of business, profession, or farm." In 2006, Lang was making $664 a month from unemployment benefits and $860 from Social Security disability payments. Lang was taken to a hospital and his attorney yesterday said his client suffered from Obsessive Compulsive Disorder. Pursuing criminal charges would be a waste or resources, the attorney said. "That would be us treating humans worse than we treat animals." 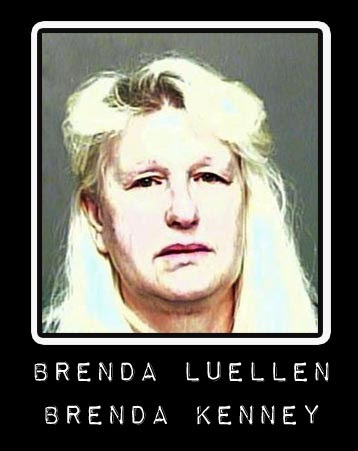 TEXAS -- Brenda Luellen (aka Brenda Kenney) is not adjusting well to life in jail. A month into her one-year sentence, Luellen, 57, spent a week in isolation in a medical cell. Inmates have picked on her, she says, and the cold in the jail makes her arthritic joints ache. 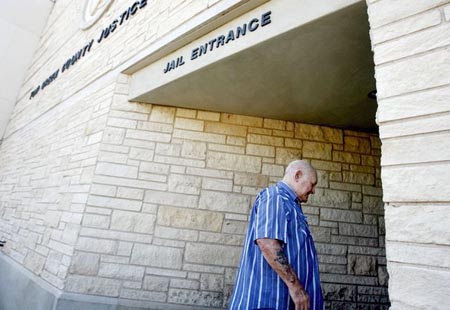 "I've never been so cruelly treated in my whole life," Luellen said during a jailhouse interview July 8. Luellen came to reluctant prominence in San Angelo last year as city authorities went to her home in The Bluffs and took away dogs by the dozen. This year saw a virtual replay, with more than 50 of the tiny shih tzu dogs for which Luellen has a seemingly irresistible predilection removed in May after neighbors complained of rank smells coming from her property and expressed concern about unhealthy conditions. 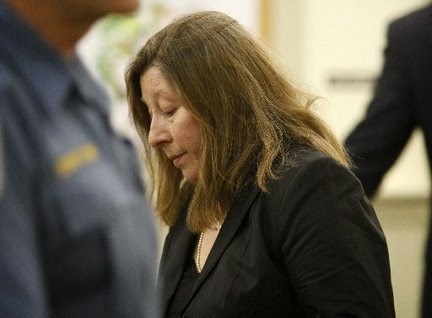 On June 19, after a brief trial in Tom Green County Court-at-Law at which she represented herself rather than hiring a lawyer, Luellen was sentenced by Judge Penny Roberts to a year in jail, the maximum jail term for the misdemeanor charge, regarding the 2008 case. Luellen pleaded not guilty Thursday to a health code violation and a violation of the city's new pet ordinance in connection with other complaints filed this May. Lt. Bill Fiveash, the county sheriff's spokesman, said jail workers did check into Luellen's complaints but couldn't find any evidence to support them. "They didn't physically hurt her," Fiveash said, "but maybe they shunned her. They probably did." For years, Luellen and Arthur Kenney, the man she has lived with for more than 30 years, have been a mystery to neighbors and an enigma to her family. 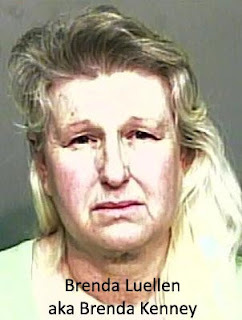 Luellen believes that all she is guilty of is wanting to raise dogs and be left alone. Her older sister, Sandra Harkey of Tuscola, says she remembers growing up with Luellen in Paint Rock. The two grew apart as they grew older, and Luellen eventually seemed to want little to do with her sister or her parents. "I love her, but I don't like her," Harkey said. "I don't understand her." Before Luellen moved to San Angelo, she traveled the country working as a nurse's aide. In the 1970s, she met Arthur Kenney, a Korean War veteran who drove trucks for a living in Washington state. The two began living together. Luellen said she owned a few dogs at the end of their time in Washington. Harkey and her cousin Loyd Joiner of Paint Rock said they remember Luellen having pets as a child. Years later, they visited the house on Kingsbridge Drive in San Angelo. As the neighborhood grew, Luellen and Kenney installed surveillance cameras around their porch and covered the windows with dark curtains. Visitors are rare. Family members said they don't have much contact with Luellen, but do remember dogs overrunning the house on Kingsbridge. Loyd Joiner recalled a recent visit. "I was in there for a little bit, but I had to get out" because of the odor, he said. Luellen said she and Kenney made the move to The Bluffs because it was quiet. Before then, the family lived near in a house near Sunset Mall, where Luellen bred and sold dachshunds and cocker spaniels. "I didn't have a whole lot (of dogs) at first," Luellen said, estimating the number at less than a dozen. After she retired from being a nurse's aid, her household became home for an increasing number of dogs, some she says that people brought her to rehabilitate. 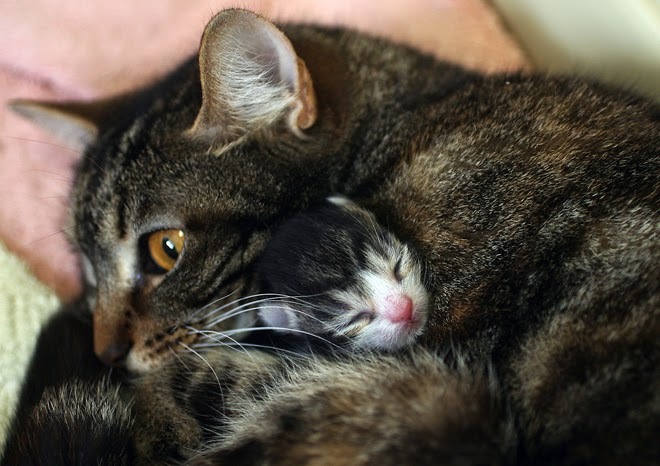 "I just love taking care of them," she said. "They have so much to give: so much love, and so much compassion." When she raised her first shih tzu, Luellen said, she fell in love. Jenie Wilson, a Shih Tzu & Furbabies Rescue volunteer, said she does not discount Luellen's passion for the dogs but said just being passionate isn't enough. "I can't say whether or not she loved her animals, but they were not cared for in a manner that was conducive to good health," Wilson said. 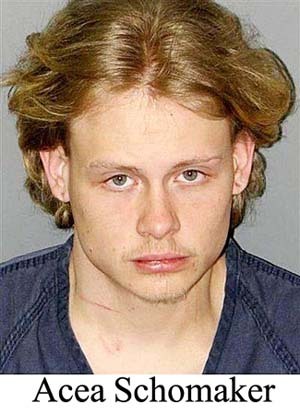 Of the dogs removed from Luellen's house in the 2008 raid, one had a broken jaw, several had broken bones in their paws, and three had to have eyes surgically removed, Wilson said. On some, the nails had ingrown into the foot pads. Urine stains showed on their skin even after the animals were shaved. 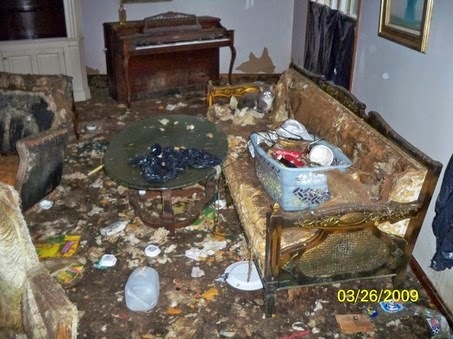 "There was some abuse and some obvious neglect in the home," Wilson said. "It can become too much for one person to handle." Based on the length of the nails and hair, she said, it appeared the dogs had not been properly groomed in years. Caring for dogs became her life and all she had to look forward to in her retirement, Luellen said. She had dogs on rotation and would bathe several animals a day, and says that although she could not get to all of them, she simply wanted to have that many. She sold animals from her home at one time, she said, but has not been in business for more than a year. Scott Blanton, a veterinarian with Green Meadows Veterinary Hospital, said Luellen treats her animals more like pets than a typical dog breeder does. 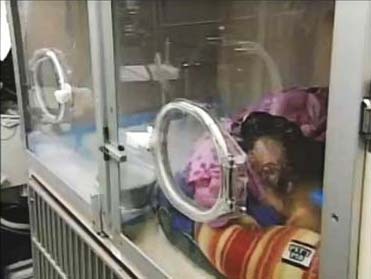 Over the years, Luellen would occasionally bring dogs to his clinic with ear or eye problems, ailments to which shih tzu dogs are naturally prone, Blanton said. Never in his examinations did an animal appear mistreated. "She tried the best she could," Blanton said. Blanton said he remembers Luellen weeping when one of her puppies died, and her grief seemed genuine to him. Blanton said he has not seen Luellen since about a month before the 2008 raid. Employees at the his clinic were shocked when they heard about at the conditions at Luellen's home after the raid. "I've never seen her abuse any of those animals," he said, but "they were in an abusive situation." Luellen and Kenney came to public prominence through the legal system. 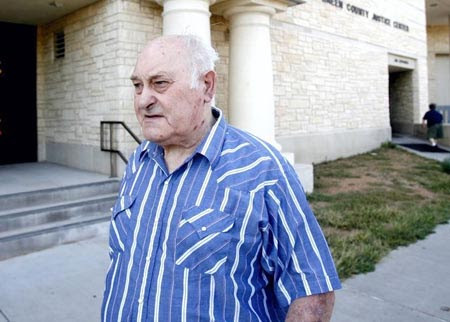 Last year in San Angelo Municipal Court, the two pleaded no contest to a charge of "waste in pens or yard" and a residential zoning violation, according to court records. They paid a total of $555 in fines and court fees for those offenses. Luellen is in jail now because she was also convicted of animal cruelty for the 2008 case - which took a year to come to court - sentenced to a year in jail and ordered to pay $18,625 in restitution to the city and a dog rescue group. Arthur Kenney's appearance in court July 17 to face animal cruelty charges was canceled - prosecutors dismissed the charges, saying they concluded that Luellen was the main culprit in the case and adding that they didn't believe Kenney fully understands what is going on around him. Even though she sold dogs out of her home, Luellen insists it was not a puppy mill. Income from the animals, which sold for $150 to $700, was just enough to care for the dogs, she said. Their $353,000 home was purchased with Kenney's money, she said. She, Kenney and their two adult sons all receive monthly disability income. THE ENTIRE FAMILY IS ON PUBLIC ASSISTANCE WHILE SHE BREEDS AND SELLS DOGS FOR UNDECLARED INCOME. According to the Tom Green County Appraisal District, the house was built in 2004. The 3,519-square-foot house and the land it sits on are valued at $353,800. Andrew Siefker, a professor at Angelo State University who lives behind Luellen's house, said that while he wishes the situation had ended better, he enjoys sleeping through the night. He said his neighbors' dogs habitually were let out of the house into the fenced yard late at night, and their barking would set off a volley of barking throughout the neighborhood. Runoff from the backyard that borders his is still a concern for him, Siefker said. Although he and his neighbor had strained relations, Siefker took no pleasure in seeing her go to jail for a year. He said he was surprised and thinks the punishment is "disproportionate to the crime." Prosecutors have said they are pleased with that case's outcome. In the one conversation he had with Luellen, he said he found her uncooperative, but that didn't stop him and other neighbors from trying to handle their problems civilly. "I find it unfortunate we couldn't communicate with them. ... We couldn't resolve this as neighbors," Siefker said. "It wasn't for a lack of trying." Luellen says she tried hard, too, when it came to her dogs. A court official told her after the 2008 seizure that she could have dogs again, "as long as I took care of them," she said. That's what led Luellen to again own the dozens of shih tzus seized this year. If Luellen believes she has done nothing wrong, she might continue to breed animals, said Dr. William Montgomery, a psychology professor at Angelo State University who has never met her. A rough analogy would be the Mormon fundamentalists who, after encountering resistance in one state, move to another, Montgomery said. "It sounds like they wanted to be left alone, to do their own thing," he said. "Unfortunately, their thing was disturbing other people." Getting out is what Luellen now has in mind. After this is behind her family, she said, they intend to leave Texas so she can raise dogs and horses and not be bothered. "I've always loved animals," she said, "and they can't take that away from me." KENTUCKY -- Dakota, the animal that badly injured 3-day-old Alexander James Smith on Monday, is at the center of a now national discussion that isn’t likely to end soon. Is she a bad dog who should be destroyed? Or is she a dog acting on a dog’s instinct and unfairly taking the blame for what was, essentially, human fault? And, now because of her complicated breed and background, has the matter become so incomprehensibly muddled that she is no longer considered a backyard dog at all? Mary Ann Zeigenfuse, a Lexington dog trainer and owner of Best Friends Obedience, said if Dakota is part wolf, she is no expert. There have been numerous reports of wolf hybrids injuring people, sometimes fatally. In 2002 in Ballard County, Ky., a wolf hybrid killed a 5-year-old boy; the animal’s owner pleaded guilty to a charge of reckless homicide. Janece Rollet, a certified canine behaviorist in Georgetown, Ky., is among the people who say that wolf hybrids are potential trouble. She said they are essentially wild animals. David Wise of Frankfort, Ky., is among those who defend wolf hybrids. So how does Wise respond to reports of wolf hybrids biting and injuring people? Michael Smith says they have had Dakota and Nikita, her sister, for four years — since they were pups. They got the dogs from a Michigan breeder. But are Dakota, and her sister who still remains in the Smith home, wolf hybrids? The dog breed itself is a matter of some controversy. Is it the same as a Carolina Dog or an American dingo? Spokesmen for the American Kennel Club and United Kennel Club said Wednesday that those registry organizations do not recognize the Native American Indian dog as a breed. However, do an Internet search and you will find sites that refer to Native American Indian dogs. According to Web sites devoted to the dog, there are only five breeders in the United States, and there’s much discussion about their position and whether they have any verifiable claim to a dog with a specific native American origin with wolf ancestry. Apparently, even the legal status of the dog has been challenged by some Native Americans. Jett said he could not say with certainty what type of animal Dakota is. “I honestly don’t know,” he said. Dr. Andrew “Butch” Schroyer from the Animal Care Clinic in Lexington said that in 25 years of practice, he has never seen nor treated this breed of dog. The disposition of the Native American Indian dog is being hotly defended this week. Ray Coppinger, a biology professor at Hampshire College who studies canine behavior, said the dog’s history — where it came from, what it has experienced — is exponentially more important than what breed it is. He’s seen similar incidents happen with dachshunds, he said. Coppinger said that although what happened to the Smiths is tragic, it’s a relatively common problem. 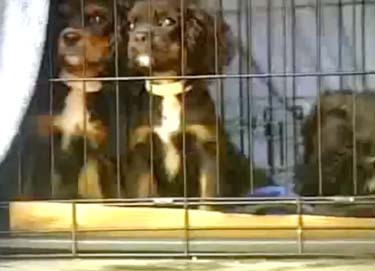 TEXAS -- Further charges have been filed by the city against a woman already charged twice and serving jail time in a high-profile puppy mill case. Brenda Luellen, who was convicted last month on an animal cruelty charge dating to April 2008, pleaded not guilty Thursday to a health code violation and a violation of the city's new pet ordinance in connection with other complaints filed in May. Pretrial hearings are set for 9 a.m. Aug. 5, according to a municipal court official. Luellen, who was in jail and unavailable for comment, does not have an attorney listed to represent her in the new case. A city legal official filed the complaints Wednesday, charging Luellen with keeping or harboring more than seven dogs without a valid multi-pet owner's permit, which is a violation under a recently passed city ordinance. She is also charged with keeping animals in a place that is "filthy, malodorous or unsanitary." In May city officials removed more than 50 dogs from Leullen's home on Kingsbridge Drive. 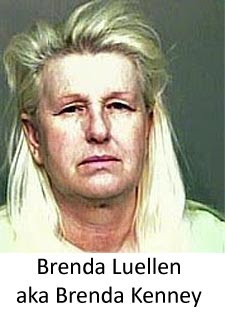 Luellen's jail sentence was imposed by County Court-at-Law Judge Penny Roberts for a violation in 2008. This year's charges do not take evidence from last year's animal seizure into account, said Amie Hajovsky, a prosecutor with the city's legal department. She declined to comment on the charges. Last year Luellen pleaded no contest to a charge of "waste in pens or yard" and paid $195 in fine and court costs, according to court administrator Linda Gossett. Luellen also pleaded no contest to a second residential zoning violation and paid $360 in fine and court costs. The set fine amount for conviction under the two charges filed Wednesday is $390. If Luellen challenges the charges in court, the penalties could be higher. "If they go to trial, that figure can change," Gossett said. If convicted, the health code violation is punishable by a fine up to $500. If the court determines the violation was done recklessly, the fine can be as much as $2,000. Violating the multiple-pet ownership ordinance could result in a fine of up to $500. WEST VIRGINIA -- A man from Kanawha County indicted on animal cruelty charges was in court for his arraignment on Thursday. Clint Casto, 30, of 913 Amherst Drive, was arrested Monday after a Kanawha County humane officer found a dead horse almost complete decomposed in a stall on Casto's property along Five Mile Hollow near Big Chimney. A second horse was in the next stall and was completely emaciated and barely able to stand, according to a complaint filed with the Kanawha County Magistrate Court. Kanawha County humane officer Johnny Brotherton said in the complaint that there was no food or water in the stalls and there didn't appear to have been any for a long time. In court, Casto pleaded not guilty to the charges. He is currently out of jail on a $25,000 bond. His trial is set for October 1. Casto was apparently a candidate for the state House of Delegates last year. KENTUCKY -- A newborn baby was hospitalized in critical condition after being taken from his crib and carried outside his central Kentucky home by a family dog, authorities said Tuesday. The infant, Alexander James Smith, is just a few days old and had been put in his crib for a nap Monday afternoon. When his parents looked outside later, they saw their pet, a 4-year-old mixed breed called a Native American Indian dog, holding the baby in his mouth, said Jessamine County chief deputy sheriff Allen Peel. The baby's father, Michael Smith, rushed outside and chased the dog into a wooded area behind the home near Nicholasville, just south of Lexington. It took the father about 10 minutes to recover his son about 200 yards behind the home, Peel said. The baby was taken to the University of Kentucky Hospital in Lexington, where he was listed in critical condition early Tuesday. Peel said the baby suffered multiple punctures and bruises. The dog, named Dakota, was taken by local animal control officials and was being quarantined. NEBRASKA -- At least 40 cats were taken away from a home in Lakeland Estates Friday morning after the Washington County Sheriff's Office and the Nebraska Humane Society were called to the home because of neighbors' complaints. According to Sheriff Mike Robinson, when deputies arrived with a warrant to search the home around 10 a.m. Friday, they discovered animal urine and feces all over the home. At least 40 cats and two dogs were found at the property on Valley View Drive. Earlier reports indicated 41 cats were discovered. The odor of cat urine could be smelled several feet from the home. Robinson said ammonia levels in the home were far above normal, and humane society workers had to wear respiratory masks to enter the home. "It's bad. Very bad," said Wesley Greve, captain of investigations for the Sheriff's Office. The cats were found to be suffering from upper respiratory problems and were underweight, said a spokeswoman for the Nebraska Humane Society, which removed the cats, including one that was dead, from the home. Kristie Biodrowski said all but four of the 40 cats had to be euthenized due to poor health. Three of the four remaining cats appear to be kittens, Biodrowski said. The dogs had fleas but were allowed to stay with the animals' owners. Robinson closed the home, calling it "non-inhabitable." Members of the Fort Calhoun Volunteer Fire Dept. aired the home out after the animals were removed. Yellow sheriff tape was cordoned around the property late Friday afternoon. Robinson would not release the names of the couple who own the animals, but according to records and neighbors, Clifford M. Gray and Juanita K. Gray live in the home at 11453 Valley View Drive. The home is listed under the name F.S. Long in the Blair phone book. Robinson said the owners of the animals could be charged with 41 counts of animal neglect. Washington County attorney Shurie Graeve said Monday morning she had not seen reports on the matter yet. The raid came as no surprise to neighbors around the home. "I'm glad they did something. People are tired of it," said Jason, a neighbor who gave only his first name. The cats often looked sickly, he said, and were always roaming the neighborhood, hiding in his garage, boat and camper, and ruining his bushes. "It was never-ending," he said. Another neighbor, Rich Manly, said the cats were a nuisance to many of the residents near the home. The sheriff, Animal Control and the Nebraska Humane Society were called several times but neighbors were told those services didn't have jurisdiction or could do nothing about the problem. Manly watched the animals being removed and was told that there were cats in the attic and the ceiling, and many were kittens. Several cats were spotted on the property about five hours after the raid. "I'd guess there's about 10-15 left," Manly said. He said he might try to catch some of them to take to the Humane Society. In 2005, Clifford and Juanita Gray were found guilty on two counts of animal cruelty after 33 cats, two dogs and a pot-bellied pig were found on the home's premises. 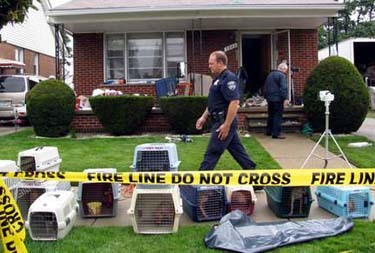 Twelve of the 36 animals were euthanized. Each served a day in jail and one year of probation on the charges. Additional counts of animal cruelty and child neglect were dropped in the 2005 case. The couple's 17-year-old child lived in the home at the time. In 2006, Juanita Gray's probation was revoked when several cats were found on the property. 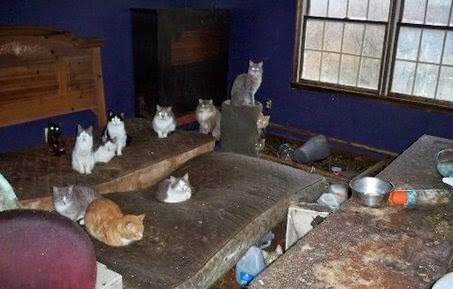 NEW JERSEY -- Wanda Oughton, whose approximately 150 cats were removed from her feces-covered, million-dollar home in Chester Township, pleaded guilty in municipal court last night to animal cruelty charges for failure to provide the felines appropriate shelter and agreed to pay more than $35,000 in expenses and fines. Municipal Court Judge Philip Maenza ordered Oughton to pay more than $2,000 in fines for the one civil and one criminal charge of animal cruelty to which she admitted. Oughton also must pay $32,000 to the township for the animals' care as part of a plea agreement between her attorney, Lawrence J. Fox, and Chester Township Municipal Prosecutor Brian Mason. Wanda Oughton wanted to provide a haven for about 150 cats at her Chester Township home, but a municipal court judge ruled she must pay more than $35,000 in fines after she pleaded guilty to animal cruelty charges last night. 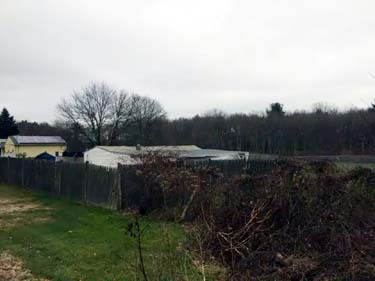 New Jersey Society for the Prevention of Cruelty to Animals officials removed the cats from Oughton's Farm Road home from March 26 to mid-April. They have been under the care of township officials and volunteers since then. Oughton also agreed to pay $1,225 in restitution to the SPCA for its investigation, search warrant execution and cat removal. Wearing a black pants suit and clutching her handbag, the 62-year-old Oughton, a widow, sat next to her grown son moments before the hearing. She said very little during the session. "It was horrible," Oughton responded when the judge suggested the ordeal of the past several months must have been difficult for her. Oughton paid $10,000 to the township last night, and the judge ruled she may pay the remainder over three years. The debt is secured by a mortgage note against her property. Township Mayor William Cogger said officials had been considering filing a lawsuit against Oughton to reclaim the expenses, which have cost taxpayers $55,000. Oughton also pleaded guilty to two township zoning violations for having two abandoned vehicles on her property, and one board of health violation for having excess debris inside and outside her home. She must pay $399 in fines for those violations, officials said. Forty-four animal cruelty summonses issued to Oughton were dismissed, as well as two summonses issued to her daughter, Maenza ruled. Oughton initially was served with 186 counts of animal cruelty. "This has been a very difficult time for Mrs. Oughton and her family," Fox told the judge last night. "This problem arose out of Mrs. Oughton's love for these animals." at the former Seeing Eye facility in Mendham. The attorney added that Oughton, who he said has worked locally in retail sales, had paid thousands of dollars for the felines' care. After the cats were removed, SPCA officials said they had not been spayed or neutered. Some of the cats actually were pregnant, and the total number of felines associated with Oughton rose to 211, officials said. When authorities removed the cats, officials have said, they found large bags of cat food dumped on the floor of a bathroom, where the cats also used a feces-filled tub as a litter box. Fox maintained the cats were "never poorly treated." "It just got out of hand. She understands that now," he said. "She took them into her home and into her heart." Fox said Oughton has cleaned her home. He said the township's board of health recently approved the house for habitation. The judge also ruled township officials will conduct periodic searches at Oughton's home to make certain she is housing no more than six cats. 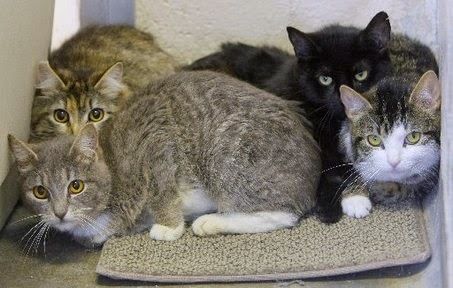 Addressing the issue of hoarding, the township council Tuesday introduced a ordinance that would require residents housing more than six cats to apply for a waiver, Cogger said. He added failure to apply for the waiver could lead to fines of up to $100. Some said the law will fall short of its goal, however. "It's not going to stop people like her," said Rick Yocum, an SPCA captain. 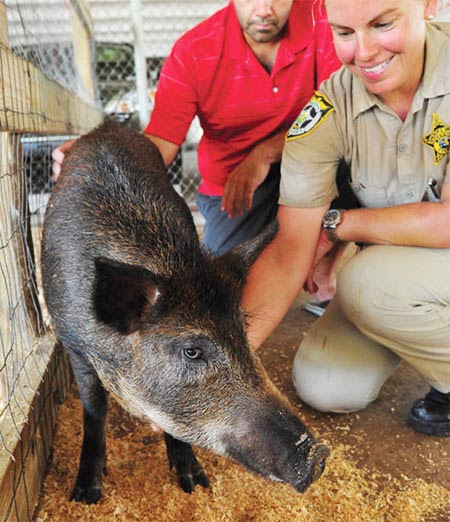 "They think they're saving animals and don't care about local laws." MASSACHUSETTS -- A Missouri man was arraigned today on animal cruelty charges after police said they rescued weak, limp and sick puppies from his van. John T. Clayton, 44, of Bolivar, Missouri, told authorities he had left from Missouri Monday night, and the puppies had not been walked since then, police said. Police said the puppies were crammed into small cages surrounded by animal waste, filth and flies in a locked box truck parked in front of a Main Street pet store yesterday afternoon. 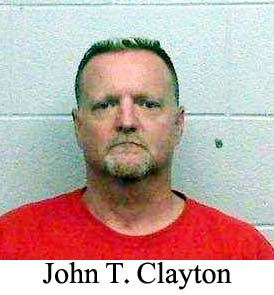 In Dudley District Court today, Mr. Clayton pleaded not guilty to the cruelty charges. Bail was set at $1,000. 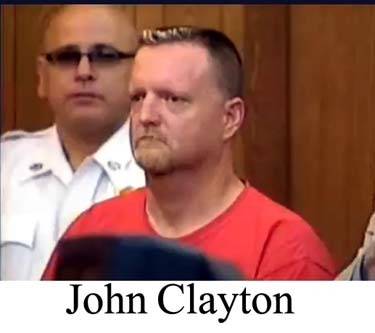 Mr. Clayton's lawyer, Peter C. Lamarine of Southbridge, said in court that Mr. Clayton is being unfairly labeled as an animal abuser. Mr. Lamarine told Judge Neil G. Snider his client comes to Massachusetts each Tuesday and Wednesday to transport animals. Mr. Lamarine said a U.S. Department of Agriculture inspector recently gave clearance for the shipment of animals. He said the animals were naturally distressed given the commute from Missouri. Assistant District Attorney Scarlett Scannell, noting Mr. Clayton lives out of state, asked for $10,000 bail. She said he is serving a three-year probation term that began this year. 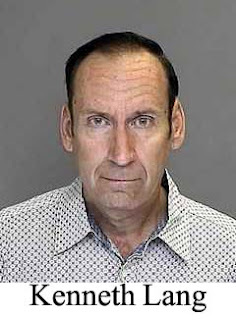 His previous offenses include endangering a child and a drunken driving arrest from the late 1980s. Ms. Scannell told the judge the case is more significant than the dogs lacking water. She noted paramedics transported seven puppies to Webster Lake Veterinary Hospital. Before his arrest, Mr. Clayton had just delivered 10 puppies to Elite Puppies, 172 Main St., and had delivered nine puppies to Laughlin Kennel in Oxford, according to police. He may have dropped off puppies at some other New England locations as well. The case unfolded after two people drove by the delivery box truck when it was parked in front of Elite Puppies on Main Street about 2:45 p.m. The two people heard barking dogs and sensed the dogs might be distressed. They flagged down a cruiser in the area and called an animal rescue organization. Police Sgt. Michaela N. Kelley went to Elite Puppies and spoke with employees. “From there it went downhill for Mr. Clayton,” Sgt. Thomas V. Ralph said in an interview this morning. 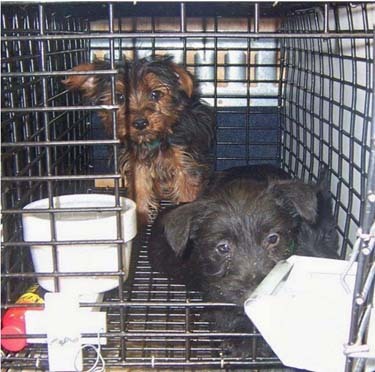 Swarms of flies surrounded cages filled with puppies in poor health, according to police reports, and there was animal waste in and around the small cages. Some puppies appeared to limp, and one puppy was completely unresponsive, according to police. There appeared to be about five puppies in each cage. "When she saw the condition of the puppies, Sgt. Kelley contacted the Animal Rescue League of Boston and the Massachusetts Society for the Prevention of Cruelty to Animals to assist in her investigation. She also called Webster EMS and paramedics to check on the puppies. About half the puppies were initially taken to the Cummings School of Veterinary Medicine at Tufts University in Grafton, and the others were taken to Webster Lake Veterinary Hospital on Thompson Road. The 10 puppies delivered to Elite Puppies remained in quarantine in the back of the store, according to police. 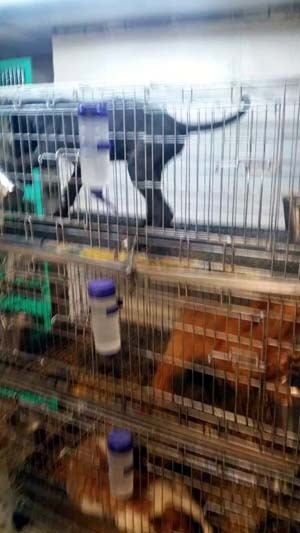 The owner of Elite Puppies, Jennifer Gardner, said in an interview this morning the store does not bear responsibility for the condition of the dogs. She said the incident has led to death threats against her. Ms. Gardner said the puppies in her store were healthy, and she had no problems with the puppies delivered yesterday. Elite Puppies is a family-run business that deals with private breeders, according to the company's Web site. Ms. Gardner declined the Telegram & Gazette's request to have photos taken of the puppies delivered yesterday. 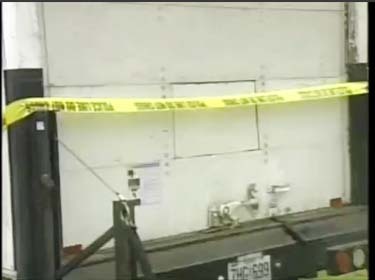 Board of Health officials inspected the store yesterday, and officials from the state Department of Agriculture are conducting an investigation of the store today, according to authorities. Sgt. Kelley said Mr. Clayton last night declined to answer questions about the puppies without a lawyer present. MSPCA Officer Christine Allenberg was the first to arrive at the scene. 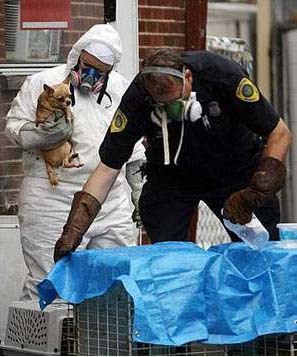 Lt. Alan Borgal, director of law enforcement for the Animal Rescue League of Boston, later mobilized a team to respond, including Dr. Martha Smith, who performed onsite veterinary evaluations, according to Animal Rescue League spokeswoman Jennifer Wooliscroft. She said all 27 puppies were transported overnight to an undisclosed Animal Rescue League hospital in Boston, where they will remain for the time being. The puppies are primarily designer and toy breeds, according to Ms. Wooliscroft, and there was one Weimaraner. 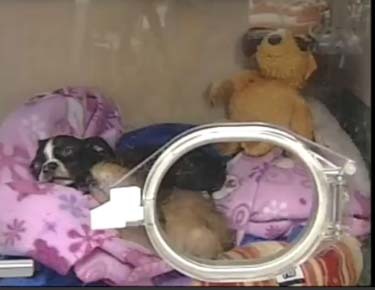 She said the condition of the puppies is still being assessed. Most of the puppies appeared to be about 5 weeks old, according to authorities. A clerk magistrate went to the scene and a search warrant was issued, according to police. There were at least 51 tags in the van, and Sgt. Kelley said there may have been 51 puppies when the van left Missouri Monday night. 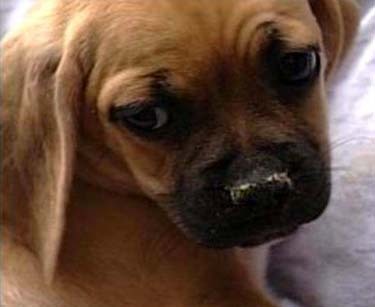 Police seized 24 puppies yesterday that had not yet been delivered. The puppies came from different states, according to the information on the tags. Mr. Clayton allegedly told Sgt. Kelley that he had been on the road since Monday night, and the puppies had not been walked since then. 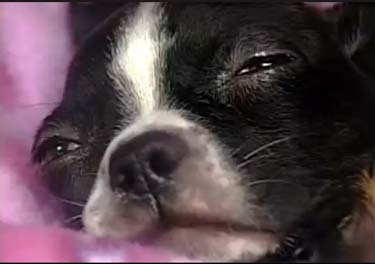 Puppy Ship is the name of the Missouri-based company that brought the puppies to New England, police said. A manager at Laughlin Kennel in Oxford, who would only identify herself as Christine P., said nine puppies from the same van were delivered about 8:30 p.m. Tuesday. She declined to give her last name. Interesting that she would vouch for him considering in 2015, this was posted, calling Laughlin Kennel a hell hole: "Former Laughlin Kennel Employee Shares Horrific Videos, Images With Turtleboy"
She said he brought a huge water jug for them to fill Tuesday night. The manager said the Oxford kennel typically gets a delivery of puppies from Puppy Ship every week. The manager said any dogs delivered to the kennel are quarantined for two days and a veterinarian checks them before they are put up for sale. Todd Davis, a representative of Puppy Ship, was in court this morning awaiting Mr. Clayton's arraignment. In a telephone interview, Mr. Davis said he planned to post bail for Mr. Clayton. Puppy Ship is a USDA-licensed company, according to Mr. Davis. He said there are strict guidelines for providing animals with adequate water, food, ventilation, adequately-sized cages and clean conditions. He said Mr. Clayton is a longtime driver for Puppy Ship. Mr. Davis said he was treated hostilely by the animal rescuers, and not permitted to go near the truck to care for the puppies. Authorities took custody of the truck. MONTANA -- Days before her trial was scheduled to begin, Linda Kapsa pleaded no contest Thursday to one felony count of aggravated animal cruelty for hoarding dogs and other animals at her Ballantine home. Appearing before District Court Judge Susan Watters, Kapsa accepted a plea agreement that limits her to owning six neutered companion dogs and imposes a maximum 20-year suspended sentence supervised by the Montana Department of Public Health and Human Services. Watters will set the final conditions during a sentencing hearing, after the Department of Corrections conducts a pre-sentence investigation, which usually takes six to eight weeks. A sentencing date has not been set. Kapsa was charged with neglecting more than 200 dogs, 27 chickens, 10 cockatiels and three cats by not providing adequate medical care, food or shelter. Remains of two dozen other dogs were removed from Kapsa's Shady Lane Kennels, at 2315 S. 14th Road in Ballantine, during raids on Dec. 11 and Dec. 30. Under the negotiated plea, Kapsa agreed to surrender the estimated 20 dogs and puppies she now keeps at her 10-acre property. The animals escaped seizure in December and have been breeding. The plea deal limits Kapsa to a maximum of 40 chickens, 20 goats, eight horses, three neutered cats and two cockatiels. She also agreed to allow state officials to visit her property without obtaining a search warrant or giving notice. However, under the agreement, Kapsa's attorneys can still ask Watters to allow her keep up to 20 non-neutered dogs. Yellowstone County Attorney Dennis Paxinos said once Watters sets the limits on animals, if Kapsa breaks those rules over the next 20 years, she could go to prison. "We were hoping we could stop the breeding. We have given her some companion dogs, and we are giving the other dogs happier homes to go to and we are stopping the taxpayers from having to fund this," Paxinos said. In December, county officials seized 189 dogs from Kapsa. About 100 regular volunteers are helping to care for the mostly English Shepherd dogs at the MetraPark fairgrounds. "With the ones that are born in our custody, I believe we now have 227 dogs, three cats, 10 cockatiels and 11 chickens," said Yellowstone County Animal Control Officer John Fleming. Because the dogs were evidence in Kapsa's court case, no animals could be adopted. The bills mounted quickly. Since January, the cost of caring for the animals has topped $157,433, according to the county. That has been offset by at least $43,331 in cash donations, along with donations of food and other supplies. In addition, other Yellowstone County animal complaints have been getting less attention this year because one of the county's two animal control officers has had to work full time on the Kapsa dogs. Kapsa was charged with two felony counts of animal cruelty and four related misdemeanors. She agreed to plead no contest on one felony count. The other charges will be dismissed. Last month, Watters heard two days of testimony about whether Kapsa was mentally incompetent to stand trial, as her attorneys argued. Billings forensic psychologist Dr. Michael Butz, testifying for Kapsa, said Kapsa believes she has some "special mystical powers" and a "special trust" with her animals. On Wednesday, Watters ruled that Kapsa was competent to stand trial, and that ruling allowed Kapsa to change her plea. During Thursday's hearing, Deputy Yellowstone County Attorney Ingrid Rosenquist read a lengthy summary of the evidence that would have been presented at Kapsa's trial. Witnesses would have testified that Kapsa's trailer home was covered with feces and a dead dog was next to her bed. There also would have been testimony that there was inadequate food, water or shelter for the animals and that 50 of the seized 200 dogs needed immediate veterinary care. Many of the English shepherds were starving, covered with feces and infected with lice, she said. Dave Pauli, the Western regional director for the Humane Society, would have testified that Kapsa's dogs amounted to "a small, feral colony of unsocialized animals" and that taking care of them would be a full-time job for 14 people. "As hungry as the dogs were, they were too scared to take food out of the hands of humans," Rosenquist said. After months of care and training, they now look like different dogs, she said, but many of them will regress unless they are with their regular handler. 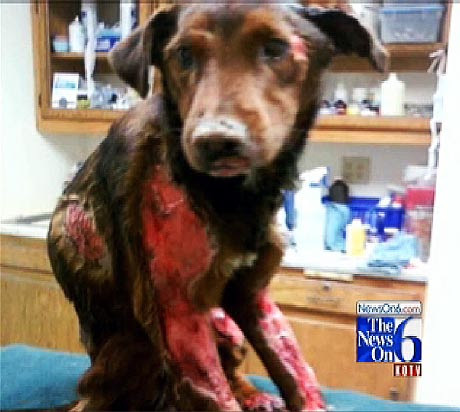 Under Montana law, the maximum sentence for felony aggravated animal cruelty is two years in prison. However, because Kapsa was convicted on a felony bad-check charge within the past five years, the county attorney's office argued that she was a persistent felony offender. That cleared the way for the county attorney's office to ask Watters to impose a 20-year suspended sentence supervised by the Department of Public Health. After the hearing, Rosenquist said she was pleased. "It's a relief for everyone, including the animals," she said. The agreement also requires Kapsa to pay an undetermined amount of restitution. Her ability to pay will be part of the pre-sentence investigation. Kapsa will get to choose the dogs she wants to keep. After Kapsa, the volunteers will get the next choice of the animals they have cared for since January. It could be several weeks before all the remaining dogs and other animals can be released for adoption. Young animals probably will be adopted first because they generally aren't neutered before four to six months and can be released earlier, Fleming said. A major spay-and-neutering clinic must be scheduled for the adult animals before they can be adopted. Paxinos urged state leaders to change the laws so that no other community has to suffer through a similar ordeal. Negotiations over the plea agreement started last winter, and the Kapsa case has been the workload equivalent of a major homicide case for his office, he said. The state's animal cruelty laws were written to protect the ranching community, said Paxinos, who noted that no one anticipated this level of domestic animal hoarding. The situations need separate sets of laws, he said. "You shouldn't be allowed to have massive amounts of animals with no feeding systems or ways of cleaning up after them," he said. GEORGIA -- On June 29 a dog case complaint was filed at a Sewell Road, Rutledge, located after a woman reported that while she was walking her Labrador to her neighbor’s house she turned her back and two Pit Bull dogs attacked her dog. The woman said she attempted to separate the dogs but failed and her neighbor fired two shots in the air but the attack continued. The woman then told the neighbor to shoot the dogs. The Pit Bull dogs’ owner apologized to the woman. The woman said the dogs are normally fenced. OKLAHOMA -- A Sapulpa woman heads to court Tuesday on charges of animal cruelty. 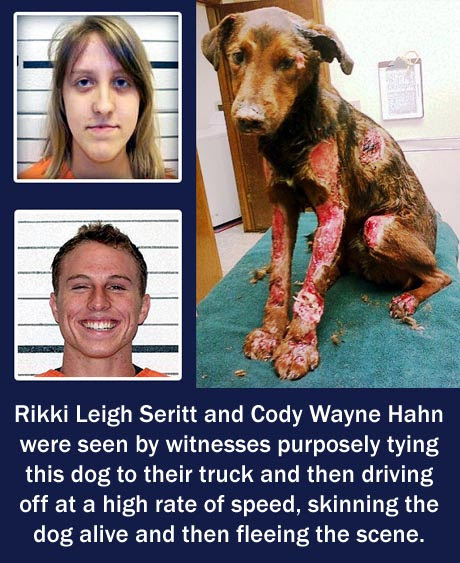 Rikki Leigh Seritt, 18, is accused of tying a dog to the bumper of an SUV in October. Witnesses say a man driving the SUV then dragged the dog along the road until it came free of its collar. Seritt is charged with a felony count of animal cruelty and two counts of obstructing an officer. Her hearing is scheduled to begin at 9:00 Tuesday morning. The dog, Sammy, survived the violence and is thriving with his new family. Witnesses identified her boyfriend 20-year-old Cody Wayne Hahn as the driver of the SUV. He was arrested and charged with felony animal cruelty. Hahn will be in court July 20th.